Singapore’s colourful Little India can seem like a chaotic attack on the senses with bursts of colour, noise and fragrance greeting you around each corner. This vibrancy is key to the area’s identity, making it feel like you have stepped onto a street in Delhi, and makes Little India a unique stop on any trip to Singapore. The first stop for many visitors to Serangoon Road is the Little India Arcade. The shops catering mainly to Indians, sell sari fabric, fruit and vegetables, Indian confectionary, sweets and snacks, religious artifacts, garland offerings, Indian music and clothes, but also offer handicrafts and souvenirs. There are a few specialty shops too, including some selling natural remedies and Ayurvedic medicines. They are fascinating to explore and offer a real Indian shopping experience albeit in Singapore. The Temple of 1000 lights was built by a Thai monk in 1927. This nickname has evolved due to the electric lights inside that illuminate a fairly simple 15m, 300 tonne Buddha statue. The temple building is unique for its combination of Thai, Chinese and Indian influences and has several interesting features. The replica of a footprint believed to be Buddha’s is displayed in ebony and mother of pearl. The temple is also home to a piece of bark believed to come from the bodhi tree Buddha sat beneath when he reached enlightenment. 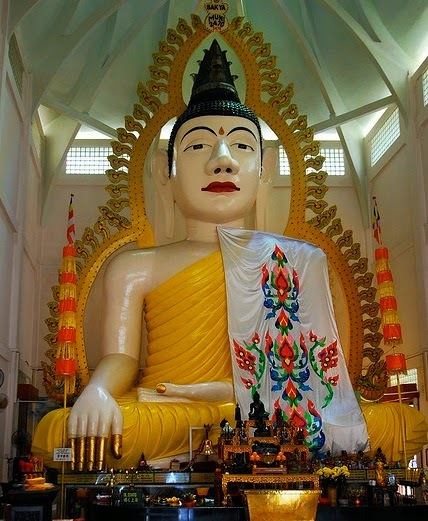 A reclining Buddha in the chamber behind the big Buddha shows events from the life of Buddha. A pair of lions guards the entrance and visitors can have their fortunes told near the prayer hall. Built in 1881 and dedicated to Hindu goddess Kali the consort of Shiva, impressive Sri Veeramakaliamman Temple makes clear the boldness of this goddess with the many statues of her looking fearsome. In several statues Kali is depicted as having several arms and legs, each holding a weapon of war. The main altar features a statue of Kali and her sons Ganesh (elephant-headed god) and Murugan (child god riding a peacock). Statues of other deities surround the temple but may be difficult to spot as the temple is currently being refurbished (mid 2014). One of oldest Hindu temples in Singapore, Sri Srinivasa Perumal dates from 1855 and is devoted to the Hindu god Vishnu. The 20 metre tall gopuram (tower at the entrance gate) features six tiers of incredible detail, showing the various incarnations of Vishnu. It was built in 1966 following a donation from one of the first Indian immigrants to find success in Singapore. Well known for it’s Hindu temples and shops selling Indian spices, jewellery, textiles, restaurants, small hotels and fortune tellers, Serangoon Road is the busy artery that runs through Singapore’s Little India and makes for a fascinating stroll. A walk along the street reveals mirrors hung above the doors of many shops to deflect evil influences, the smells of freshly prepared food and the bright and cheerful flower shops. Flowers hold an important place in Indian culture as they are often crafted into garlands and offerings for the deities in temples. Have you been to Little India in Singapore? What would you suggest other visitors don’t miss?